It was Lisa's last day recently, as she is going off to study dietetics. I thought that it would be most fitting to make her a "healthy" cake to send her on her way. 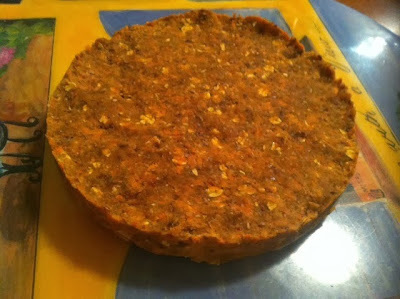 I chose Teresa Cutter's raw carrot cake, the recipe for which is online here. As hoped, this cake was a hit with the recipient - she was stoked with her healthy cake. 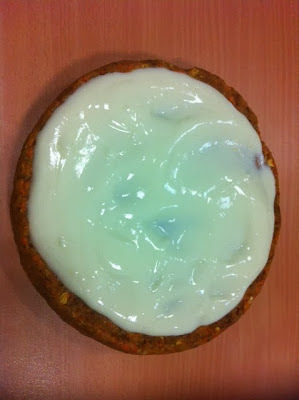 And although I didn't try it myself, someone told me unsolicited in the lift that they enjoyed the carrot cake. Sweet! I hope that you all had a merry Christmas! For our last French Friday with Dorie this year, our recipe is Dilled Gravlax with Mustard Sauce. Gravlax is sweet and salty cured salmon. In this case, we used salt, pepper and sugar, herbed up with dill, to cure the salmon. It takes about 3 days, so don't consider doing this one for a quick dinner. The end result with the mustard sauce is delicious. I wasn't overjoyed by the pumpernickel I served it on, so I finished off the gravlax by itself with the sauce. I think this is one of my favourite ways to eat salmon yet. I was also stoked because I had just bought a new filleting knife, so I could cut the gravlax into neat slices instead of mangling it. To see what the other Doristas thought of this gravlax, visit the LYL section of the website. 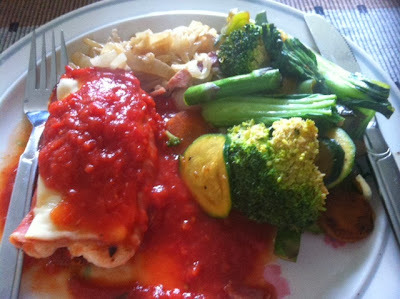 To celebrate Christmas, we have the Wednesday with Donna Hay recipe for red chicken chosen by Kayte. Or, as it is called in Modern Classics I, Italian Baked Veal (or Chicken). You can find the ingredient list here. 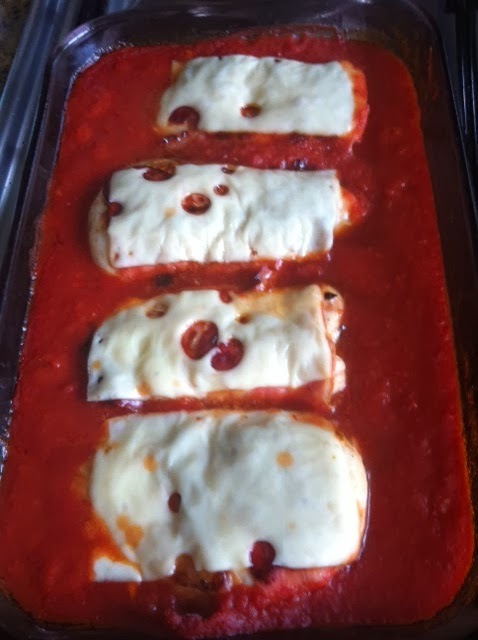 Basically, this recipe comprises chicken baked in tomato sauce (I used pre-bottled sauce rather than make my own), wrapped in prosciutto and topped with cheese - I used Swiss cheese as I couldn't find mozzarella slices. This was really delicious, but very filling. To see what Kayte, Margaret, Chaya and Sarah thought, visit their websites. Aren't they gorgeous? And they are the very essence of Christmas with their bright red coats. I have been eyeing up a recipe for Red Currant Cake since the last time I saw red currants. I selected a recipe that I found here. Why this one? Because I have German ancestors on my mother's side, and any German recipe makes me feel closer to them. I followed the recipe to a "T", except that I only used half of the red currants because otherwise, the cake would cost too much to make. The red currants are what makes this cake, as the tartness of the currants contrasts with the sweetness of the cake base and meringue topping. I think that you could use almost any fruit or berry in this cake, provided it wasn't too moist. Gooseberries come to mind, although they are rare here too. 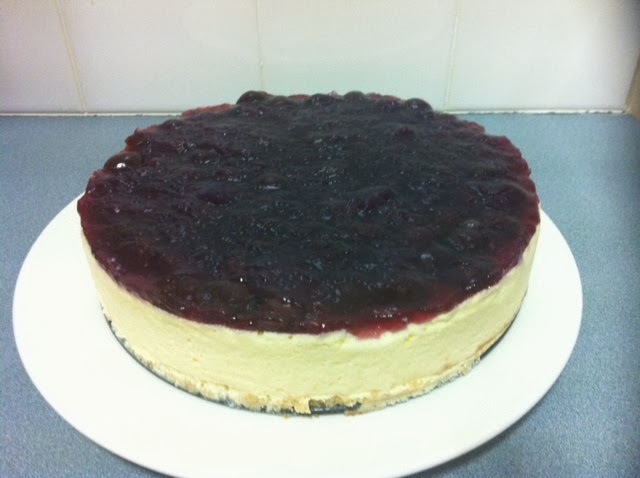 If I come across red currants again in the future, I would definitely make this tasty, light, refreshing cake again. 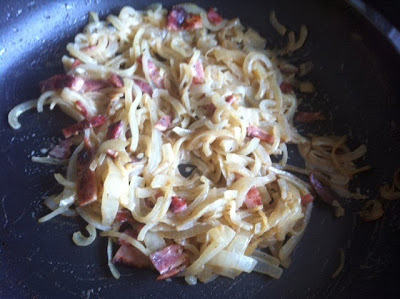 FFWD - Recipe Swap Onion "Carbonara"
Does this look like pasta to you? It does to me, so I can only assume that is where the dish got its name from. However, don't be fooled - this week's French Friday with Dorie recipe is for creamed onions with bacon. Sometimes, even though something doesn't look pretty, it tastes really good. So it was with this Avocado and Banana Bread, the recipe for which I found here. The inspiration for making this cake is that I had two avocadoes and two bananas that I wanted to use up before I went on vacation. In the end, I needed one and a half avocadoes, and I omitted the nuts. It is also a cinch to make, as most of the work is done by a food processor. This bread is really moist and is surprisingly not very dense. The overwhelming flavour is banana, so if you love banana bread, and wanted to try a paleo version, this recipe is for you. Verdict - I'd make it again. 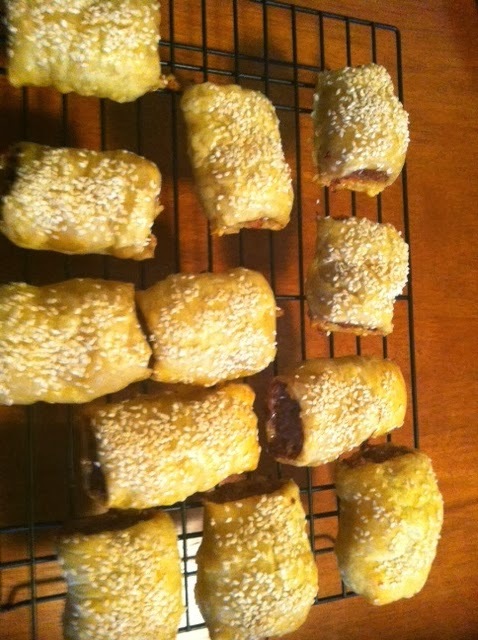 This week's Wednesday with Donna Hay recipe is sausage rolls, selected by me. The recipe is in Modern Classics I, or online here. For Aussies, the sausage roll is a classic. It features at parties, in lunchboxes or on long drives when you stop at the bakery for a quick lunch. In short, it is a national treasure. I noticed that online, Donna classifies this as a recipe for kids. This may be why she was very light on the spice. Me, I would have loved more spice, more kick. However, these were OK - I can get my kick from the sauce, because as you know, a sausage roll has to be dipped in sauce before eating, preferably tomato. I halved the recipe and still managed to comfortably get 12 chubby sausage rolls. To see what Kayte, Margaret, Chaya and Sarah thought of the sausage roll, visit their websites. Today is Vlad's birthday. He's a cheesecake afficionado, so I once again made Abbey's Infamous Cheesecake, and added a splash of Kirschberry to the batter. On top is a drained can of black cherries, and I jellied the reserved cherry juice with a dessertspoon of cornstarch mixed with a little water over heat then poured it over the cherries arranged on top of the cake. I used a new springform pan this time, and because it is dark, it did not seem to bake as well - the cheesecake was a little runny in the middle and I have never had that problem before, having made this cheesecake on at least three previous occasions. I will have to remember that the darker pan needs a longer cooking time. (Ironically I had to buy a new springform pan because I busted the old one making Vlad's cheesecake last year.) Or perhaps it was because I used light cream - I can't remember if I have ever used light cream before, but I wanted to reduce the fat content - perhaps I should just submit and use heavy cream! Oh well, it tasted great anyway and mostly held together. It did the trick. Another addition to my Christmas boxes this year was Dorie Greenspan's Linzer Biscuits, cut into the shape of snowflakes. 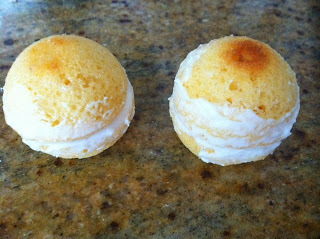 You can find the recipe for these biscuits here. 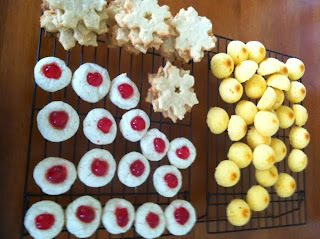 However, they are worth the effort - these biscuits are delicious, sandwiched with jam or not. It's French Friday with Dorie time again, and this week, we are tackling a dish that has long been barracked for by those who want to get unpleasantries out of the way - Mme Maman's Chopped Liver. My chopped liver has a pink tinge because Dorie said the livers should only be cooked until rosy in the centre - yet on all the photos I have seen on the Web, it is a drab brown. I don't care if that is not right, as it tasted good just like it was. Then again, all of the photos of chopped liver that I have seen depict it as a kind of processed sludge, not unlike Peck's paste in appearance - this version is chunky and gutsy, yet soft enough to spread. Despite the fact that this dish sounded gross, I actually really liked it. Who knew? And it was cheap as chips - apparently the market for gizzards is not very big. To see what the other Doristas, thought, visit the LYL section of the website. My friend Craig has a gluten and dairy free diet, so this made his Christmas box a little different to everyone else's. I made him amaretti from this recipe (which I obtained from my class with Pauline Leonard at Gewurzhaus), subbing gluten free flour for the small amount of plain flour. Don't you think they look perfectly Christmassy with their red cherry hats? I found the boxes on eBay and they are very sweet. I think they are a present in themselves. 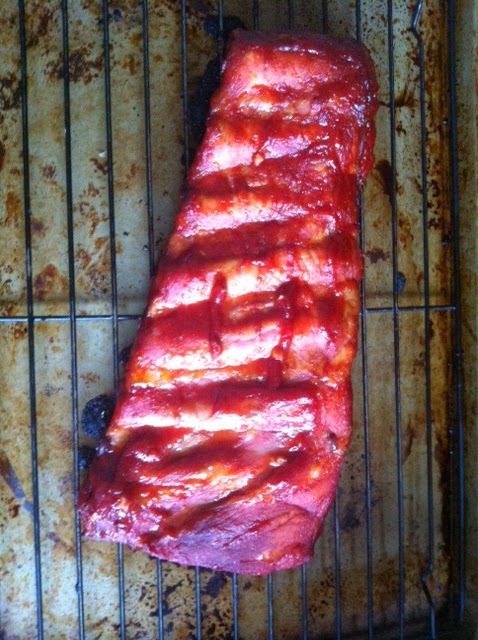 Today's Wednesday with Donna Hay recipe is American Style Beef Ribs, chosen by Sarah from Modern Classics Book I. The recipe is also posted online here. For some reason, my ribs didn't go dark in colour, but I don't care - they tasted good anyway. What's not to like about pork ribs in a spicy tomato-ey, caramelly sauce. To see what Sarah, Kayte, Margaret and Chaya thought, visit their websites. 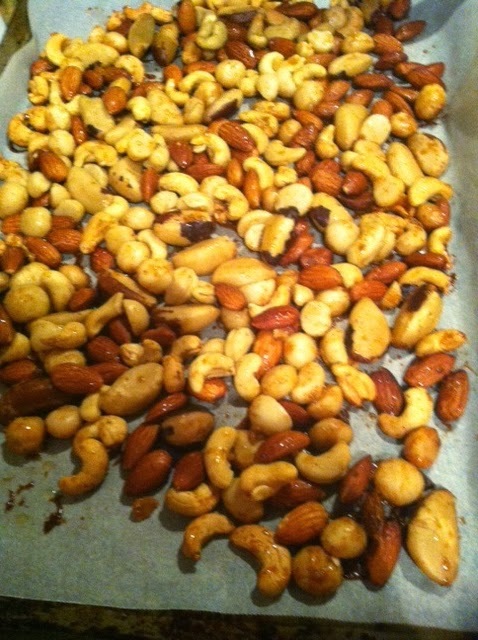 Continuing on the great Christmas cookoff, today's treat is spiced nuts, made using this recipe from Taste. Of course, you don't really need a recipe for spiced nuts, but I always worry that I will be too heavy handed with the spices if I don't follow one. These nuts are just devine - I didn't have paprika so I used half a tablespoon of cayenne instead, and it was just perfect to me. The spiced nuts are super easy to make and a great treat for parties or to put in Christmas treat boxes, which is what I did. If you like your nuts with a bit of kick but not too much, these are for you. Enjoy! 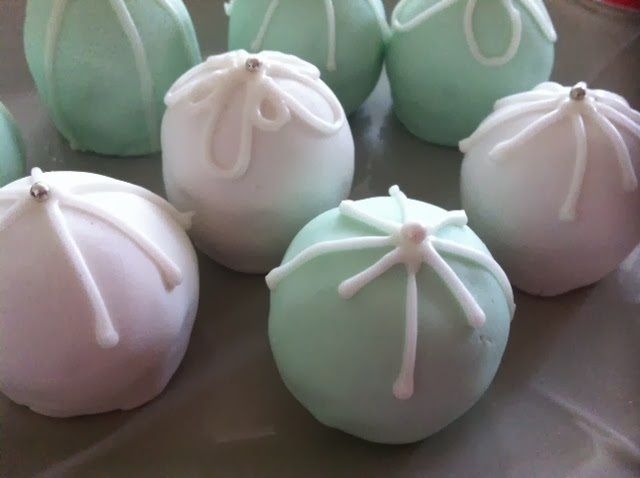 This year, I desperately wanted to make Christmas bauble cakes (also known as temari cakes), because they look so gorgeous, and I have had the spherical mould for ages. I found a great video on Youtube by Joe Hargreaves on how to make them here. However, do not be fooled - Joe makes this look like a breeze, when in reality, it is a nightmare - a very long nightmare. I made 14 of these cakes, and they are very time consuming, especially if you have other things to do as well. The base cake recipe that I used was a madeira cake from Taste. 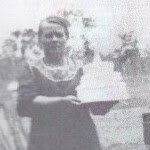 Frustratingly, I couldn't find what cake recipe people were using in my research, but someone mentioned that using a dense cake is best and they suggested madeira cake. I was going to use the chocolate cake recipe that I made my Dalek cake from, but it didn't take well to the spherical moulds. 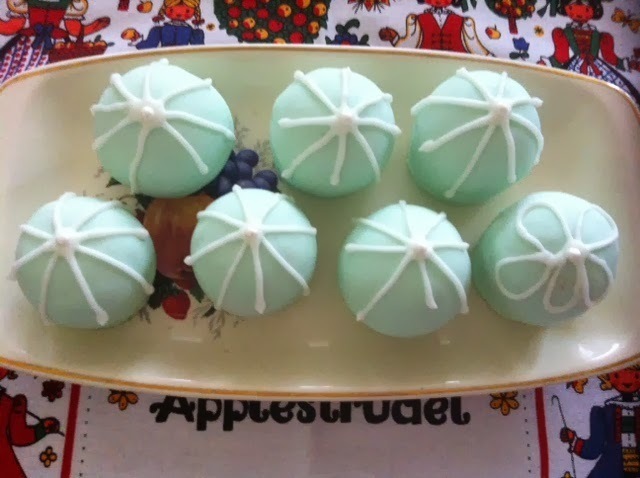 The first three that I made were not the greatest - two showed the join around the middle and I stretched the fondant too far on a third, so that the jam showed through a bit and the fondant had little stretch marks. I also found it difficult to avoid pleating around the base on all of them. And they seemed to take forever!! However, in the end, I am happy enough with them - I can see all the faults, but when I look at the photos, they turned out pretty well. There you go - if you are feeling creative and have quite a bit of time up your sleeve, you can try making Christmas bauble cakes this year. They look really good finished off with lustre, but I just don't have the time or inclination. It is my boss, Mark's, birthday today. As a birthday surprise, I made him chocolate cupcakes and brought them into work on Friday. The surprise was on me, as he wasn't there. Accordingly, they are still living in the fridge at work in the hope he is back on Monday. I used the chocolate cupcake recipe for The Primrose Bakery's Cookies and Cream Cupcakes, and chocolate "fudge" icing from The Crabapple Bakery cook book. I then topped the cupcakes with chocolate rocks - they look pretty good, if I say so myself. Preheat your oven to 190°C. Line 2 x 12-hole muffin trays with 16 cupcake papers. Melt the chocolate and leave to cool slightly. Beat the butter and sugar together in a stand mixer until creamy. Separate the eggs (reserve the whites in a separate bowl), add the egg yolks to the butter and sugar, and beat well. Add the melted chocolate and beat to combine. Sift the flour, baking powder, bicarbonate of soda and salt into a bowl and stir together. Combine the milk and vanilla extract. Add the flour and milk alternately to the batter, beating well after each addition. Whisk the reserved egg whites until they form stiff peaks, then fold the eggs whites into the batter until combined. Spoon the mixture equally into the cupcake papers, and bake in the preheated oven for 20–25 minutes. Leave the cupcakes to cool in the tin for ~ 10 minutes before turning out onto a wire rack to cool. Sift the icing sugar and cocoa into a bowl and set aside. In the bowl of a stand mixer, beat the butter for 1-2 minutes, then add the milk, vanilla extract and half of the icing sugar mixture, and beat until the mixture is light and fluffy. Add the remaining icing sugar and beat again until the mixture is light and fluffy. Spoon icing into a piping bag fitted with a star nozzle and pipe onto the cooled cupcakes. Top with chocolate rocks or whatever decoration you desire. Today's French Friday with Dorie is an "oh dear" moment. No, not because of Blogger's penchant for rotating photos at ridiculous angles with no mechanism for reversing it. It is because the recipe is Almond-Orange Tuiles - and things really did not go well. I made a half batch using almond meal (misinterpreting "finely cut almonds" for almond meal). Do not try this at home - the tuiles won't spread. When I turned up the oven to see if that would make them spread, it burned the bottoms of them. Into the trash they go! On the next night, take two; that is when I read "finely chopped almonds" as "put almonds in a food processor and chop finely, but do not pulverise". I also skipped the resting in the fridge part for the dough, thinking that this may actually have stopped batch one from spreading. 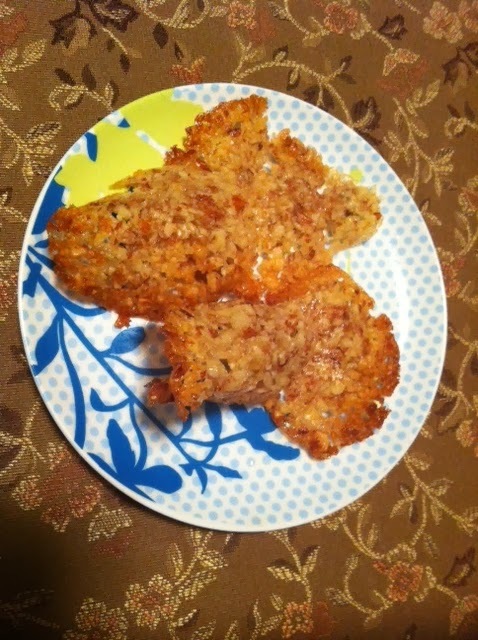 Success, in that the tuiles spread and resembled what they should have this time. Followed by epic fail - the tuiles stuck to the egg lifter I used to get them off the trays, they fell off the rolling pin and tore, and those that did hang around never set - they were too soft and lost their shape immediately after leaving the rolling pin. Don't get me wrong - these biscuits tasted good (what's not to like about nuts and butter) - but they just didn't do what they were supposed to for me. I subbed OJ for lemon juice as I didn't want to waste a whole orange for a few tablespoons of juice. However, they were too much of a pain in the behind for me, so never again. To see if the other Doristas had better luck, visit the LYL section of the website. 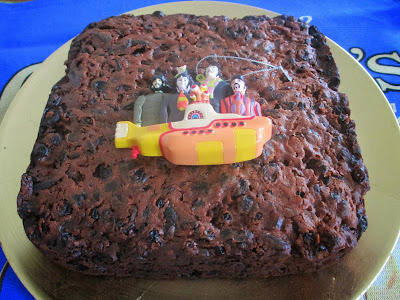 I made my Christmas Cake in September this year to give it some time to mature. The recipe that I chose is from the Australian Women's Weekly Christmas Food and Craft, dubbed "Celebration Fruit Cake". You can also find the recipe online here. I liked the fact that there were no nuts in this fruit cake recipe, as the nuts tend to make the cake crumble when you cut it. I intend to ice the cake with marzipan and fondant and cut it into pieces as part of my annual Christmas gift boxes. When I opened the cake up for the first time this week, it smelt very reassuringly boozy, so I hope that is a good sign. I haven't been "feeding" the cake as the recipe does not require it. I am also very happy with the colour - I like my fruit cake to be dark. Are you making food as gifts this year? And if so, what are your favourite food gifts to make? 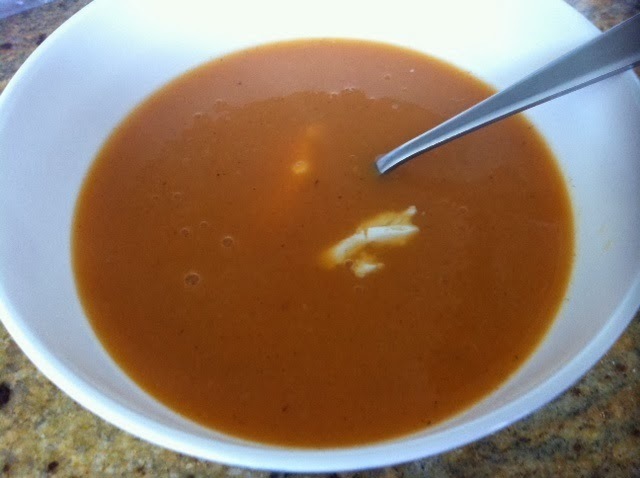 This week's Wednesday with Donna Hay recipe is Sweet Potato Soup with Goat's Cheese, chosen by Chaya. The recipe is online here. I was not a fan of this soup. It was a little thin for me, andit seemed to need some spice. The goat's cheese added flavour, but seemed to sink into the soup. Unfortunately, this is not a repeat for me. To see what Chaya, Kayte, Margaret and Sarah thought of this soup, visit their websites. While in Tasmania, Tim and I stayed at Piermont Retreat in Swansea, a charming place with stone cottages, a private beach and rolling grounds. If you want to get close to nature, then Piermont Retreat is the place for you. In the evenings, possums, wrens and rabbits abound. Of course, it would have been remiss of us not to dine at the restaurant at the retreat, unsurprisingly called Piermont Restaurant. It is open every night except Wednesday, and sits in a prime position overlooking the grounds of the retreat. The restaurant serves local food and wine in a fine dining atmosphere. The potatoes were the highlight - I could have easily eaten them all myself. Although the toasts topped with raspberry powder were presumably for dipping in the brulee, I found them rather odd. Overall, the food was good, and the location was spectacular. It was definitely worth going, although pricey (mains ~$36). If you are in Swansea, do check out this restaurant. On Saturday night, we had our office Christmas party at the Park Hyatt in Melbourne. The theme was The Great Gatsby, which suited me to a T.
I had the prawn cocktail, which unusually had potato salad in the middle. I liked it. I scored the chicken, which suited me. It was a fun night. The music was definitely not Gatsby era, so that we could all dance the night away. Late into the evening, there was even a staff band! If you like 1920s fashion, do check out my photos from Miss Fisher's Costume Exhibition at Rippon Lea House here.